Anjali Forber-Pratt Anjali is a born fighter. Born in Calcutta (now known as Kolkata) India, Anjali lived in an orphanage for two and a half months before being adopted by her loving family from Natick, Massachusetts. Two months after arriving in the United States, she contracted an illness resulting in the diagnosis of transverse myelitis, a neurological disorder that affects the spinal cord. Rushed to the hospital, she was not expected to live. However, her fighting spirit prevailed and Anjali survived. Transverse myelitis left her paralyzed from the waist down. Anjali was introduced to the world of disabled sports at the young age of 5. She attended a sports clinic for children with disablities at the Massachusetts Hospital School in Canton, MA. Exposed to a variety of sports, young Anjali took a strong liking to track. She quickly excelled and by the age of 9 she was competing at the national level in track and field. Anjali found her way back to the track in 2006. Currently she is ranked among the top three fastest T53 women in the world for the 100 meter, 200 meter and 400 meter events. “While my races did not go as well as I had hoped, the London 2012 experience was absolutely incredible to be a part of,” Forber-Pratt said. “I proudly wore my Team USA jerseys and had the experience of a lifetime racing in front of sold out crowds of 80,000 in the stadium. It brought me tremendous joy to be on the start line with two of my competitors from Ghana and Bermuda because I played a small role in helping to get them to the world stage. Anjali truly exemplifies the qualities every professor wants in a doctoral student -- commitment, attention to detail and creativity. Without a doubt, she will rank among the most outstanding students I have worked with in my career. ANJALI FORBER-PRATT Bios - on the right column under "Related documents" UPDATE: Anjali Forber-Pratt Makes U.S. Paralympic Track & Field Team …Sets Sights on Gold Medals at London 2012 Paralympic Games Wheelchair sprinter Anjali Forber-Pratt heads for London as a member the 2012 U. S. Paralympic team after winning her spot at the trials in Indianapolis this weekend. As a former world record holder and a bronze medalist from the Beijing Paralympic Games, Forber-Pratt is in contention for multiple medals at the London 2012 Paralympic Games. She will compete in the 100m, 200m and 400m. 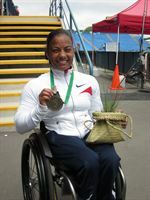 Wheelchair sprinter Anjali Forber-Pratt heads for London as a member the 2012 U. S. Paralympic team after winning her spot at the trials in Indianapolis this past weekend. 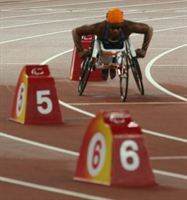 As a former world record holder and a bronze medalist from the Beijing Paralympic Games, Forber-Pratt is in contention for multiple medals at the London 2012 Paralympic Games. She will compete in the 100m, 200m and 400m. (Champaign, IL - July 2, 2012) - Wheelchair sprinter Anjali Forber-Pratt heads for London as a member the 2012 U. S. Paralympic team after winning her spot at the trials in Indianapolis this weekend.